ate datacentres and distributed enterprises. The ability to customize port configurations gives IT professionals maximum flexibilty to meet specific network requirements and makes the M5600 ideal a a hub appliance with many remote locations to secure. The Firebox M5600 is available with Standard Support, the NGFW or full Security Suite, as well as DLP and APT Blocker. Call us on 03300 881114 to discuss your requirements in detail and get a personalised quote. Trade in any manufacturer's security product for a Firebox M5600 with 3-yr Total Security Suite including WebBlocker, Application Control, spamBlocker, Gateway AntiVirus, IPS, Reputation Enabled Defence, Network Discovery, Data Loss Prevention (DLP), Dimension Command, APT Blocker, DNSWatch, Threat Detection and Response, and Gold Support. free onsite setup and configuration with one of our in-house engineers. Trade in any manufacturer's security product for a Firebox M5600 with 3-yr Security Suite including WebBlocker, Application Control, spamBlocker, Gateway AntiVirus, IPS and Reputation Enabled Defence. WatchGuard Firebox M5600 with 1-yr Security Suite including WebBlocker, Application Control, spamBlocker, Gateway AntiVirus, IPS and Reputation Enabled Defence. WatchGuard Firebox M5600 with 1-yr Security Suite including WebBlocker, Application Control, spamBlocker, Gateway AntiVirus, IPS, Reputation Enabled Defence, Network Discovery, Data Loss Prevention (DLP), Dimension Command, APT Blocker, DNSWatch, Threat Detection and Response, and Gold Support. WatchGuard Firebox M5600 with 1-yr Standard Support, providing software updates, technical support and device warranty with advance hardware replacement. WatchGuard Firebox M5600 with 3-yr Security Suite including WebBlocker, Application Control, spamBlocker, Gateway AntiVirus, IPS and Reputation Enabled Defence. WatchGuard Firebox M5600 with 3-yr Total Security Suite including WebBlocker, Application Control, spamBlocker, Gateway AntiVirus, IPS, Reputation Enabled Defence, Data Loss Prevention (DLP), Dimension Command, APT Blocker, DNSWatch, Threat Detection and Response, and Gold Support. WatchGuard Firebox M5600 with 3-yr Standard Support, providing software updates, technical support and device warranty with advance hardware replacement. WatchGuard Firebox M5600 High Availability with 1-yr Standard Support. Suitable as the passive member in an active/passive cluster. 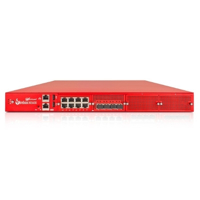 WatchGuard Firebox M5600 High Availability with 3-yr Standard Support. Suitable as the passive member in an active/passive cluster.